Mr. Siddhartha Pahwa, CEO, Meru Cabs Pvt. 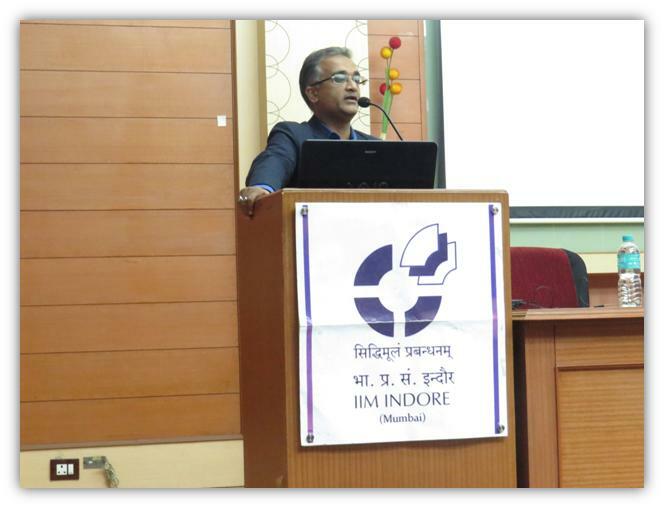 Ltd., visited IIM Indore Mumbai Campus on December 26, 2014 to interact with the PGP participants. Mr. Pahwa shared his experience of association with companies like Abbott Healthcare Pvt. ltd, Piramal Healthcare Limited, Hindustan Unilever Limited, PricewaterhouseCoopers India and Meru Cabs Pvt. Ltd. He has completed his studies from The Institute of Cost Accountants of India (ICWA) and The Institute of Chartered Accountants of India (ICAI). During his insightful lecture, Mr. Pahwa shared different innovative technology systems which are cost effective and have also improved convenience for the customers and employees. He spoke about the importance of a number of self-learning innovative algorithms and gave sheer significance to technology for thriving in the market and providing differentiated services.